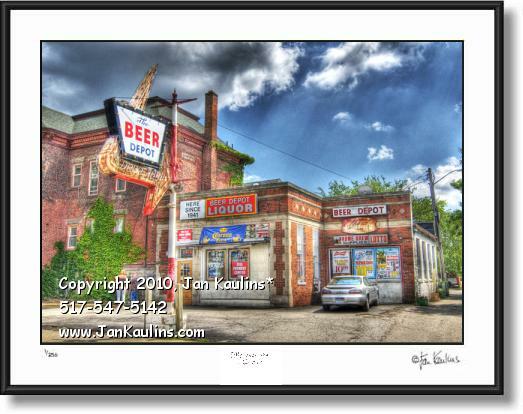 ANN ARBOR photo art print photograph for sale of THE BEER DEPOT. This is a MULTIPLE EXPOSURE ANN ARBOR BEER DEPOT photograph fine-art print offered for sale. The Ann Arbor Beer Depot, on William St. near Main, in Ann Arbor MI is a local icon, having servied townies and students to excellent selections of brew since 1941. For much of its existence it was one of the few Drive-In beer vaults around. ANN ARBOR PHOTO ART PRINT PHOTOGRAPH FOR SALE. Ann Arbor MI HDR photo photography art prints photos by artist photographer Mr. Jan Kaulins for sale.